The sixth edition of the Milano Design Film Festival brought a pleasant surprise: discovery of an Italian monument linked with a great master of world architecture, the church of Riola Vergato by architect Alvar Aalto. A little-known building even among architects, built in one of the interior regions of Italy that Mario Cucinella celebrated in the Archipelago Italia exhibition in the Italian Pavilion at this year’s Biennale in Venice. “Non abbiamo sete di scenografie. La lunga storia della chiesa di Alvar Aalto a Riola” is the complete title of a documentary film by director Roberto Ronchi and reporter Mara Corradi, which might be translated as “We are not seeking drama. The long story of Alvar Aalto’s church in Riola”. The film condenses into sixty minutes a story which, as the title suggests, is more than a decade long. 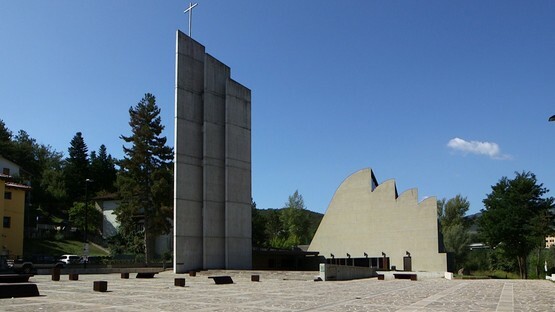 The story of Finnish architect Alvar Aalto’s only project in Italy, a church in Riola Vergato, a small town in the province of Bologna in the upper reaches of the Reno River, is also the story of the people who aided, permitted and waited patiently for the construction of the project. 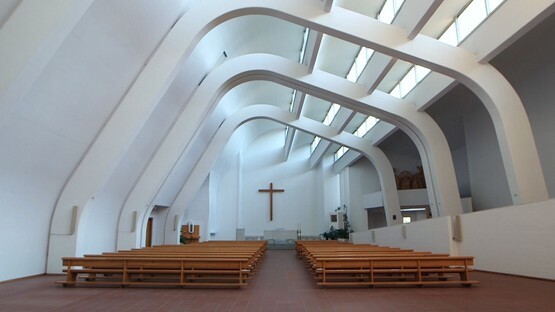 From Cardinal Giacomo Lercaro, who appointed architect Alvar Aalto in November 1965, to the Finnish architect himself, parish priest Don Luigi Borri, known as the “farmer priest”, who made the construction of the church his mission, and entrepreneur Mario Tamburini, manager of Grandi Lavori, the company that agreed to build the church in the face of economic and political hurdles. The title of the documentary, “Non abbiamo sete di scenografie” comes from a statement Cardinal Lercaro made in his 3 December 1966 speech presenting the plans for the church to the press and the authorities. The Cardinal remarked that the church was designed to respond to the needs of the small community of Riola, not to show off with a monumental construction. Mara Corradi and Roberto Ronchi’s documentary is based on the same philosophy, for it becomes clear right away that the focus is not on “drama” or celebration of the work of architecture itself, but images of the natural surroundings and territory of Riola, and the stories of eyewitnesses and little anecdotes told by the people of Riola that give the story its substance. The story is told from the point of view of a young student in Bologna who happens to come across a newspaper cutting about the church in Riola in a book about Alvar Aalto. The discovery that a work by the great master of the Modernist Movement stands just down the road encourages the student to study the project in greater depth, as Mara Corradi and Roberto Ronchi did themselves. As his (and their) research unfolds it shows how the church’s history fits into the history of Italy, and of the province of Bologna in particular, in the sixties and seventies, a time of suburban sprawl, of structural and spiritual renewal in the church following Vatican II, and of enterprising spirit among builders and the development of prefabrication. Along with the building’s architecture, images and testimony, little anecdotes emerge, marginal stories illustrating people’s expectations, the passion with which the local citizens welcomed the project and the long wait of this community that immediately identified with the church designed by the great architect who came from far away. The two filmmakers’ angle on the story and the soundtrack that accompanies it illustrate all the serenity of this place of worship, its light and spirituality, as the mosaic is put together and viewers find themselves outside the door about to step into the church.